We believe that no one should have to choose between their freedom to travel and their constitutional rights. We will never give up our efforts to ensure that the government, in an earnest attempt to protect us, doesn’t strip away the very liberties that made us a free nation. Monitoring legislation, defeating detrimental laws, and educating city, county, state and federal officials about the amazing community of full-time RVers is a long-term commitment. It’s a commitment that Escapees has fulfilled for the past 40 years. The issues are complex and sometimes controversial, so each one requires careful scrutiny and deliberate well-though-out action. Escapees RV Club remains politically neutral and does not endorse one party over another. When we take an advocacy position, it will always be with a clear conscience and the intent of goodwill. We realize that is a hard line to walk in politics, but it is our pledge. In the end, it is all about defending, protecting and securing legislation that promotes RVers’ civil liberties, and preserving our right to travel and live the RV lifestyle unencumbered by discriminatory laws. We cannot fight every fight; and, we will not win every time we chose to fight. However, we will vigorously defend RVers’ rights, where and when we can. Approximately 1,000 official letters notifying members that they must prove their residency within 30 days or they will be placed on a suspense list and ballots will not be counted, had been sent when the Texas Secretary of State’s office issued an order to “cease and desist” until a full hearing occurred. A hearing took place, and the presiding judge lifted the Secretary of State’s injunction and allowed an additional 9,000 residency confirmation notices to be sent. Once again, the voters in question had 30 days to respond. Attorney General’s office requested a new trial based on evidence that Cathie Carr presented from her files from the Polk County Tax-Assessor-Collector (Marion Bid Smith). 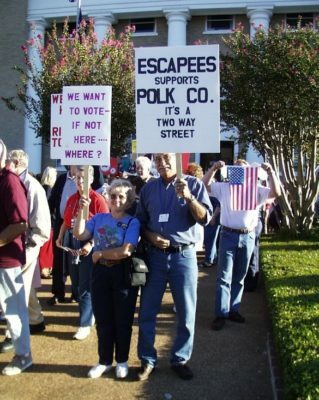 Escapees formulated a full-blown protest at the Polk County Courthouse. In a second hearing, the presiding judge ruled in Escapees favor and stopped the mailing of residency confirmation notices to the remaining 8,000 voters and required the tax-assessor to send a letter to all those who received a notice to disregard the confirmation card they were sent. Opposition appealed the judge’s decision and won an appeal, forcing a final decision to be made on the Federal level. An Escapees-led caravan went to Austin, Texas and marched at the Supreme Court in protest. A three-judge panel the U.S. District Court ruled that the en masse challenge was potentially discriminatory and would require a “preclearance” from the U.S. Department of Justice in order to take place now or in the future. Escapees voters were found eligible to vote and may disregard notices of residency confirmation. Via a contested County Commissioner’s race, some 10,000 Escapees voters were called into question. Even though the Federal Courts ruled in favor of Escapees’ eligibility to vote in the 2000 national election, the issues determined in the courtroom at that time were confined to specific statutes in the Election Code. Escapees announced the institution of a “legal defense fund” to be used solely for the protection of RVers’ rights. While the voting rights of full-time RVers residing in Livingston, Texas continued to be upheld, Escapees RV Club reached out to members of the U.S. Congress, urging them to consider legislation that will protect the voting rights of full-time RVers nationwide. Sample letters were posted on Escapees website and members are urged to contact their state representatives to prevent unintentional disenfranchisement. Escapees offered both support and assistance to the ACLU who brought a lawsuit against the state of Tennessee when 286 full-time RVers were dropped from the voter rolls. To date, the case has been dismissed. There is no confirmation on an appeal. A bill in South Dakota legislature attempted to exclude full-time RVers who chose South Dakota as their domicile from voting in that state. After Escapees (with help from members in a grassroots campaign) petitioned the senator and congressman who introduced the bill, they decided to withdraw the bill. Escapees CEO Shawn Loring visited the State Capitol in Austin to meet with legislators to suggest sample language to prevent a potentially hazardous bill (HB-389) from having a negative impact on RVers. Representatives were highly receptive to the suggestions made. Escapees reported that after conversations with the author of HB-389 and other representatives, the author agreed to remove the detrimental language that would have prevented the use of a mail service address to establish a voter’s residence. In the end, the bill did not pass. Escapees RV Club instituted a “Call to Action” to defeat legislation with the potential to prohibit overnight parking of RVs in all unauthorized places. Escapees rallied its members to write industry officials and RV organizations to uncover each group’s official position on the overnight parking controversy. The Recreational Vehicle Industry Association (RIVA) voiced its support of Escapees RV Club. Escapees instituted a “Call to Action” in Illinois. Due to pressure from the Illinois Campground Association (ICA), Illinois considered a new health law that will prohibit RVers from parking at Walmart. Escapees suggested its members boycott all RV parks who are members of that association. Escapees contacted the Illinois Division of Environmental Health to open a dialogue and put a stop to regulations that will stop overnight parking at Walmarts. Walmart Corporation sent a letter of appreciation to Escapees RV Club for its overnight parking etiquette creed (Good Neighbor Policy) and extended an invitation allowing RVers to park overnight at Walmart stores at locations that are able to do so. Escapees RV Club continued to fight local ordinances that will make overnight parking a violation except in designated campgrounds. They reminded and encouraged all RVers to abide by a strict code of etiquette that is downloadable on Escapees website. They reported that they are working with various associations (such as ARVC) to find middle ground and are continuing dialogue with Rapid City, SD. From Alaska to Montana to Nevada, Escapees was busy working to defeat ordinances that would prohibit overnight parking anywhere but in campgrounds. Some campground owners, with the assistance of the National Association of RV Campgrounds (ARVC), continued to push for stricter regulations despite our efforts to reach a reasonable compromise. The Good Neighbor policy began to gain momentum. FMCA, Airstream and Gulf Streamers have added their logos alongside Escapees RV Club. While other RV-related clubs have been invited, to date, no others have been willing to take a stand and put their name on the line. RV clubs must support and circulate the Good Neighbor Policy and encourage their members to abide by its guidelines. Campgrounds must back off on supporting and encouraging litigation, legislation and county ordinances that deny private enterprise the right to allow RVers to stay one night. RVers must agree not to abuse the system by extending their stays, even when a store manager has given them permission to do so! –Billings, Montana: City Council amended the existing overnight parking ordinance to allow overnight parking stops up to 10 hours duration anywhere in the city. –Prince George, British Columbia: The City Council rescinded its ban on parking! –Laughlin, Nevada: Escapees publicly challenged the Health Department to disclose any documentation that supports their position that RVs dry-camping presents a public health or safety hazard. Escapees continued to work with local officials to reopen overnight parking at local casinos. –Elko, Nevada: Litigation between Double Dice RV Park and the City of Elko who have allowed overnight parking at Walmart continued. –Vancouver, Washington: After a great deal of negative bogus news reports, the city council agreed to compromise and allow travelers to rest at Walmart for a few hours without prejudice. Escapees RV Club President Cathie Carr, brought the Good Neighbor Policy to the industry “round table” where representatives from every large association were present (ARVC, RVIA, RVDA, KOA, Good Sam, FMCA), as well as other smaller RV Club officials. FMCA already showed public support for the policy and most of the other clubs agreed to bring the issue to their boards and then get back to us. Overall the feedback was very positive. ARVC, however, hasn’t provided any official statements and it appears their position has not changed. We were pleased to announce more RV organizations joined the list of supporters of the Good Neighbor Policy. Bounders, Loners on Wheels, and Born Free Leapin’ Lions, along with Wally Byam Caravan Club, Gulfsteamers International, and FMCA joined Escapees. The Discovery Owners Association, Winnebago-Itasca Travelers Club and RVing Women were the most recent additions to the Escapees Good Neighbor Policy which now totaled 10 organizations who sanction the overnight parking creed. The history of the Good Neighbor Policy was continually publicized and the need for compliance was encouraged. The policy was now endorsed by 17 RV organizations. An assembly committee in Anchorage, Alaska proposed a ban on RVers boondocking in business parking lots. After pressure from Escapees and upset RVers, the proposal was abandoned. We feel that bringing Escapees Good Neighbor Policy, sanctioned by 18 major RV organizations helped alleviate some of the committee’s fears. While Escapees has been victorious in its many critical battles to protect the constitutional rights of RVers, an endless stream of laws and regulations continue to surface. A prime example is an ad valorem tax which significantly impacts travel trailer owners in Texas and other legislation across the states that target RVers unfairly. A Texas constitutional amendment created a new ad valorem tax which significantly impacts travel trailer owners. Escapees began a massive undertaking to overturn this law. Escapees exposed a “foul play” component behind the Texas travel-trailer tax. Escapees RV Club and the Texas Recreational Vehicle Association (TRVA) worked in concert with Senator Todd Staples to draft legislation that will offer provisions that give the legislature authorization to “exempt from ad valorem taxation a travel trailer not held or used for the production of income.” If successful, this will avoid the requirement to place a constitutional amendment before the voters before action can take place. It will repeal the tax and provide immediate relief from further taxation. SJR 25 and SB 510 pass! These bills not only repealed the changes instituted by Proposition 14 (which created the travel trailer tax), they offered necessary language to protect against undue RV taxation in the future and call for a refund of the tax collected in 2002! Similar bills are still moving through the Texas State Assembly. Escapees announced that the Motor Fuel Fair Competition Act (SB 211) was introduced into the South Dakota Senate, which would establish a minimum six percent markup on gasoline sold at any retail outlet or gas station in South Dakota was been defeated. Escapees reported that bills in the Texas Assembly and Senate that repeal the travel trailer tax have been passed and signed by the Governor. The Polk County Appraisal District agreed to send refund checks from the tax collected for this purpose in 2002 which were mailed out in November. Sealing the deal, Proposition 5, the Texas travel-trailer tax repeal constitutional amendment passed by 63 percent of the voters. Escapees worked with state representatives to introduce bills in the Assembly and Senate that will repeal a tax surcharge on diesel recreational vehicles. When the United States Postal Service announced new regulations that would require all incoming mail for customers using a mail-forwarding service use a new insignia “PMB” (which stands for “private mail box”) in addition to the requirement that the PMBs be written on a separate line (using a mandatory 4-line format), as well as other discriminatory regulations, Escapees quickly rallied support to rescind those stringent requirements. Escapees learned new U.S.P.S. regulations will discriminate against RVers who use a mail-forwarding service anywhere in the nation. Escapees rallied 30 Escapees member-families to join them in Washington D.C. to demonstrate at the Capitol. They visited with every congressman and senator that will see them. Escapees won the support of 42 congressmen who will support a bill that will prevent discriminatory actions imposed by the U.S.P.S..
Escapees reported that there are now 53 co-sponsors supporting a bill (HJR-55) that will rescind the most discriminatory portions of the U.S.P.S. mandates. Escapees and its supporters made further headway with the U.S.P.S. Compromises are expected. Escapees alerted members to a public comment period and asked them to speak out against U.S.P.S. stringent PMB regulations and officially oppose the highly personal information that the U.S.P.S. will require to be shared on Postal Form 1583. Escapees members were alerted to the public comment period. The Federal Register closed the “public comment” period on April 12, 2000. The support to allow the use of a number sign (#) was overwhelming; however, 50 attorneys general signed a letter (which is believed to have been composed by the U.S.P.S.) opposing the number-sign option. At the time of printing there was no official word regarding the number sign or three-line address format options. Escapees announced a victorious compromise with the U.S.P.S. that finally approved the optional use of a number sign (#) in place of the previously mandated PMB designator. U.S.P.S. also backed off their originally sought four-line format and agreed to accept a three-line format. To make the victory even sweeter, the U.S.P.S. extended the compliance deadline a full year beyond its original demand. While the average citizen takes a driver license for granted, full-time RVers can encounter unexpected obsticles when regulatory changes take place. Since driver licenses are commonly used as an acceptabe form of identification across the United States, laws regulating the issuance of a driver license are interconnected with other regulatory agencies and various legal componets can adversely affect full-time RVers unintentionally. Escapees reported that a new bill in the U.S. Senate (S.307) entitled the Driver License Fraud Prevention Act could pose a whole new set of challenges for full-time RVers. Escapees submitted supplemental language to the American Association of Motor Vehicle Administrators that will eliminate the automatic disenfranchisement that the original language could have created. Escapees worked with the Texas Department of Public Safety to clarify misinterpretations of a newly formed law that resulted in some individuals using a mail forwarding service address to be denied a driver license. With the help of Texas Representative John Otto, the issue statewide was quickly resolved. Efforts to protect RVers’ rights continued. Despite diligent research by a team of attorneys in both South Dakota and Texas, an undisclosed policy by South Dakota Department of Public Safety prevented members from obtaining a driver license using the mail service in Box Elder, SD for a short time. The issue was quickly resolved after Escapees worked directly with the DPS director and DPS counsel. Many full-time RVers depend on satellite TV to get their news and entertianment. FCC regulations are enacted that hamper RV and mobile customers. Escapees contacted the major satellite providers and special waivers are accepted with certain limitations. Escapees updated members on headway made on RV waiver forms that will assist traveling RVers to receive local news and entertainment via satellite. Escapees made further headway with satellite providers to accept waivers from RVers. PBS access was a big issue but Escapees reports making headway with Dish Network. Great victories can be accomplished when RVers, dealers, manufacturers and associations work together toward a common goal. When it comes to legislative bills that affect motor vehicles across the nation, industry unity is key. Escapees went to bat when it learns of a new California law that will consider all trucks over 10,000 pounds (GVWR) to be “commercial” vehicles and will require drivers to have a motor carrier permit, regardless of use. Due to quick action by Escapees RV Club the commercial compliance law in California was overturned. California State Assembly Bill 2175, which would increase the maximum allowable length of motorhomes driven in California from 40 feet to 45 feet, was vetoed by Governor Gary Davis. Escapees vows to assist RVIA in a continued effort to increase motorhome lengths in California. Escapees continued to assist RVIA to overturn legislation currently limiting RVs to 40 feet in California. Escapees reported that 45-foot motorhomes are now legal in California. Escapees warned members about new CAFÉ (corporate average fuel economy) requirements. A new procedural change involving vehicle inspection procedures in Texas caused a backlash that requires vehicle owners to return to the state 90 days prior to registration renewals. Escapees immediately sprung into action and was working with the Department of Public Safety, the Department of Motor Vehicles, alongside state representatives to modify the law to better accommodate travelers. Some bills are controversial in nature. Escapees RV Club is careful not to speak on behalf of its members unless there is a clear majority of support. In certain instances, reports are merely informational, in other cases, our voice is strong and clear. Escapees shared information about the Federal Activities Reform Act of 1998 and publically opposes the National RV Campground Owners Association (ARVC) position. HB 1142 and SB 5775 were introduced in Washington State. These bills called for an excise tax (five to eight percent) on all RVs registered in the state to help pay for state park maintenance. While Escapees RV Club felt it is important to help fund public parks, it felt it is unfair to tax only RV owners, who are not any more likely to use the parks than auto-truck owners or hikers and bikers. Thankfully another RV-specific tax is struck down. Escapees RV Club advised that the Federal Lands Recreation Enhancement Act (HR 3283) bears watching as it has the potential to make major changes in the fee structure for most public lands and national parks. The Federal Lands Recreation Enhancement Act (HR 3283) was a controversial bill from the start. On one hand, many felt that the fee demo program will improve park and public lands funding by keeping the majority of the fees at the parks where they were collected. Others believed that these lands should be free to all Americans and are concerned that rate increases may get out of hand. Escapees RV Club feels it would be presumptuous to speak on behalf of a divided membership; therefore, alerts were sent via Escapees E-news bulletins, providing specific contact information so that all individuals can directly voice their opinions to the legislators and committee members working the bill. Escapees was investigating potential threats to RVers’ ability to use state parks in Pennsylvania and Bureau of Land Management (BLM) land nationwide. Terminology used in legislation and law can be unintentionally detrimental for full-time RVers. Escapees RV Club tries hard to monitor phrases like “legal residency,” “fixed dwellings,” “physical locations,” and these simple little words can have disasterous consequences. Escapees RV Club warned members that new homeland security laws could create unintentional fallout for full-time RVers. Terminology targeted “legal residency” as being a fixed physical geographical location that many state and federal agencies rely on for verification purposes. Escapees RV Club vowed to help legislators and their working committees to better understand the unique needs of full-time RVers by educating them on the safety of legal CMRAs (Commercial Mail Receiving Agencies) as ideal alternatives for those who do not have a fixed physical dwelling place. Negotiations that began in 2002 just now reached the United States Congress floor as part of the REAL ID Act of 2005. Language coming from the Motor Vehicle Administrators Association proposed a new definition of residency as part of the requirements to qualify for a driver license which said: “A person must have an actual physical dwelling place in the jurisdiction in which he or she seeks to obtain a driver license or identification card.” Escapees RV Club interjected some minor wording changes so that the definition would instead read: “A person’s primary residence or domicile must be located within the jurisdiction in which he or she seeks to obtain a driver license.” As you can imagine, this minor change made a world of difference for full-time RVers. Escapees government affairs team traveled to Austin, Texas to meet with State Representative John Otto and Senator Robert Nichols to refresh discussions that are important in the ongoing protection of RVers’ civil liberties. We felt this was especially important as Texas progresses toward implementing the Federal Real ID directives. Escapees RV Club, under the auspices of RVIA, joined a coalition of clubs and industry associations referred to as RVAct. One of the projects the coalition was investigating is “RV-Friendly” road-signs icons. The program was recently tested in Oregon with favorable results and Louisiana has introduced legislation to authorize testing there as well. Escapees sought opinions from the membership at large. Escapees RV Club solicited help from members in each state who might serve as contact persons should lobbying need to take place there. Members who have good relationships with state officials in their home state, or have background in this area, are asked to contact Escapees national headquarters. HUD (Housing and Urban Development Department) decided to alter their definition of RVs. Escapees concern was that the language used by this federal agency could prevent RVers from legally living full-time in their RVs. Escapees submitted alternative language and we are waiting on the verdict.